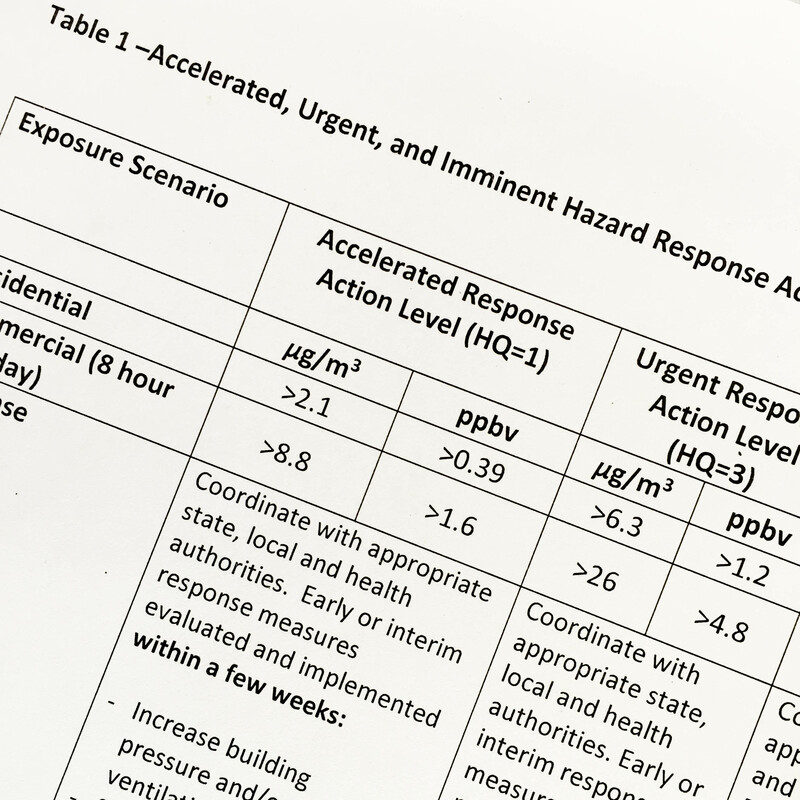 In August, Ohio EPA issued new guidance prescribing response actions and remedial timeframes applicable to vapor intrusion investigations. While the August guidance addresses a variety of common chemicals encountered during vapor intrusion investigations, its primary focus is on trichloroethylene, or TCE. The new guidance sets forth a range of TCE concentrations in indoor air that, according to Ohio EPA, warrant “accelerated response,” “urgent response,” or “imminent hazard response.” At or above concentrations of 20 micrograms per cubic meter in residential properties or 60 micrograms in commercial or industrial properties, Ohio EPA recommends relocation of building occupants until indoor air is adequately remedied. The commercial/industrial threshold is 0.001% of the workplace concentration legally permissible under OSHA regulations. You read that right—Ohio EPA now recommends evacuation of workplaces if TCE concentrations are one thousand times lower than the permissible OSHA concentration. First, a little background. TCE has been used since the mid-1900s for vapor degreasing of industrial parts, an extraction solvent for greases, fats, and oils, a refrigerant, and a chemical intermediate in the production of other chemicals. TCE can be released to the environment through its manufacture, formulation, and use. It is a ubiquitous soil and groundwater contaminant at industrial facilities, due primarily to its common use as a degreaser. It is moderately water-soluble, and frequently found in ground water. US EPA has stated that it has found TCE in at least 1,045 of 1,699 current or former sites designated on the CERCLA National Priorities List. The primary routes of TCE exposure for the general population are through ingestion of drinking water and inhalation of TCE in ambient air. TCE is a common indoor air contaminant by virtue of the process of vapor intrusion, i.e., the migration of TCE vapors from contaminated ground water and soil. According to the Agency for Toxic Substances and Disease Registry (ATSDR), mean TCE concentrations in ambient air across the U.S. are between 0.01-0.3 ppb, although ambient mean levels as high as 3.4 ppb have been reported. For workplace environments, OSHA has established a TCE general industry permissible exposure level (PEL) of 100 ppm TWA (time-weighted average). That value is equivalent to 537,000 micrograms per cubic meter. But in 2011, U.S. EPA issued a revised health assessment for TCE through its Integrated Risk Information System (IRIS). The 2011 IRIS health assessment included, for the first time, a chronic toxicity guideline, or “Reference Concentration” (RfC), for TCE. The RfC is an estimate of the maximum continuous exposure level that is not expected to harm humans (including sensitive subgroups) over a lifetime of exposure. The 2011 IRIS health assessment established a RfC of two micrograms per cubic meter, driven primarily by a scientific study suggesting the potential for fetal cardiac malformations at exposures above that level. The cited study has been called into question by outside scientific commenters. Ohio EPA’s August guidance roughly mirrors the U.S. EPA Region 9 accelerated and urgent response level recommendations. In addition, the Ohio EPA guidance adds a third exposure tier above which relocation of building occupants is apparently mandatory. 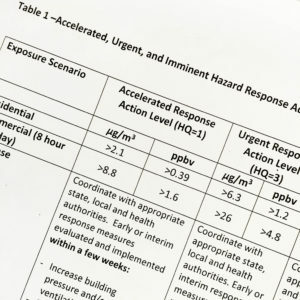 That third tier, called the “Imminent Hazard Response Level” in the Ohio EPA guidance, sets a threshold of 20 micrograms per cubic meter in residential settings and 60 micrograms in commercial or industrial settings. While Ohio EPA’s August guidance is not legally binding, it is clear that EPA staff intend to apply the guidance in their decision making at sites affected by vapor intrusion. Ohio EPA’s August guidance can be found at http://epa.ohio.gov/portals/30/Response%20Action%20Levels%20for%20VOC%20Final08.24.2016.pdf.